01/26/2019 UPDATE: Build 20190126 has been released! This version corrects a data type conversion issue with the multi-monitor feature. I am in the process of transitioning my own home setup away from Windows Media Center. You can read about it here and what this will mean for the Amazon and Netflix addins. When reporting issues with the software, please see the FEEDBACK section of the PDF file included with the installer. I will need the requested diagnostic information and the plugin.log file. Welcome Streamers! 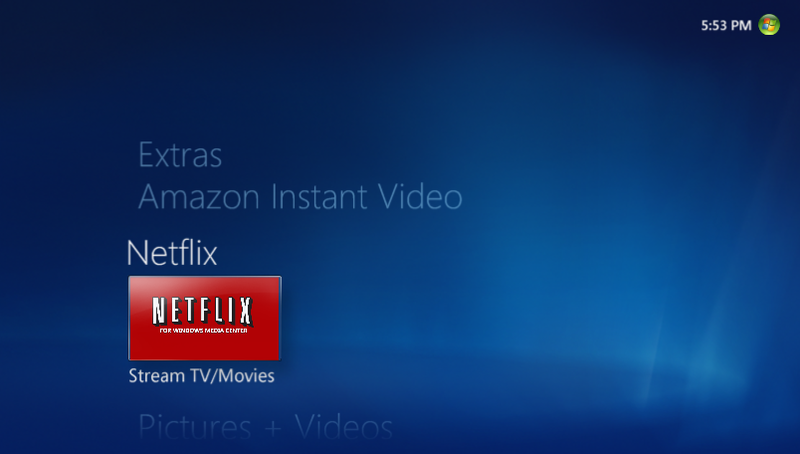 This page will serve as the home for my latest project – a replacement application for the aging Netflix plugin in Windows Media Center 7 and 8.x. The project is in the very early stages but I wanted to share my goals/objectives and document the progress. Secondary Goals include the addition of an on-screen keyboard when logging in and using feature such as Search. While my last streaming plugin (AmazonMCE) was a full Media Center native application (with the exception of the SilverLight player), this application will be a WinForm application with a MCML registration and launch point. Why? Because Netflix no longer provides the casual developer access to their API. This approach has both advantages and disadvantages. The key advantage is that we’re just calling the web-based Netflix application via a web browser embedded in a WinForm app. I don’t need to worry about API access, designing a UI, getting access to their encrypted streams, etc. The primary downside is that the web application is not remote-friendly – and that is where the bulk of my work now resides – building a remote-control library that I can inject into their page and have it do the navigation, selection and playback controls we all expect a native WMC app to do. Here is a short video showing the current progress of the Remote Control JS library. In this demo I can arrow-down to the first row of videos, select the first one (which is highlighted in red) and then I can invoke the Play function by clicking OK on the remote. Still a lot to do. I am currently working on finishing the page ‘map’ so I know how to apply the remote-control functionality. Also beginning work on the MCML registration point. If my schedule cooperates I hope to have something in the way of a Beta release by November. I haven’t decided yet if this addin will be free (funded by donations) or if there will be an app fee. If I decide there needs to be a cost for the addin it will be minimal – under $5 probably. Donations are always appreciated though – and if you choose to donate now towards this project and I end-up charging a fee, you will receive a copy at no additional charge. So one thing I have heard from the community is that they want a better way to search content on the app. The on-screen keyboard is nice – but let’s be honest – it’s not ideal or ‘cool’ in any way. So above is the new Search App running on my iPhone 6. 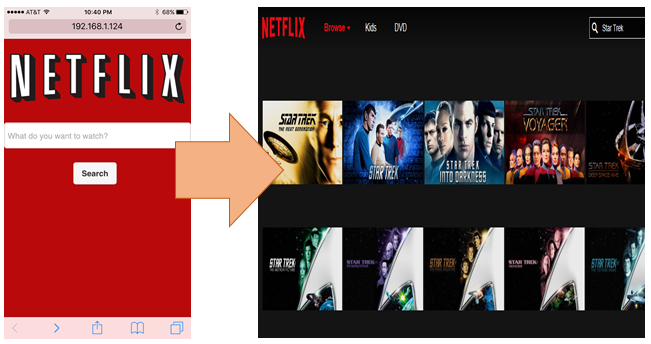 It is a web-based mobile app that is served by the NetflixMCE app itself. It should work on all modern smartphones, tablets and web browsers – but obviously optimized for the mobile touch-enabled devices. Once the search results are visible, you can navigate to your desired choice and start watching. The app may have even more uses – as soon as I dream them up. What do you think? Good idea? Not worth it? Let me know in the comments below. Thanks! 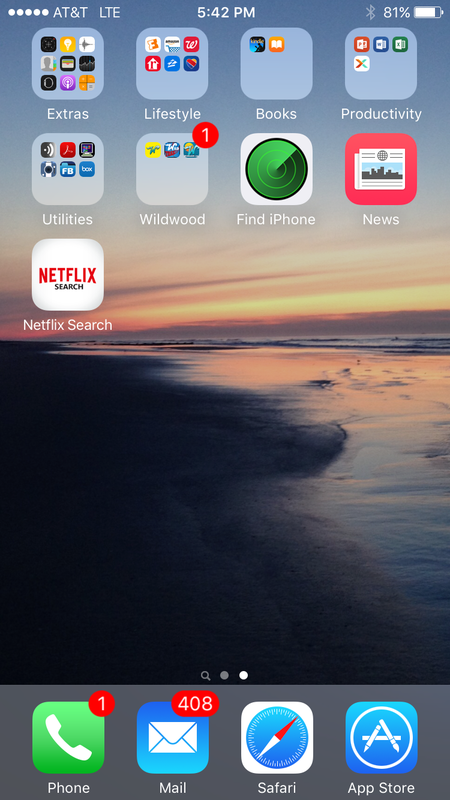 The Netflix Search mobile app is also functional and feature-complete for the beta. It’s working really well – and even has the wife’s seal of approval for ease of use – so that’s something. Biggest challenge is (no surprise) the remote control stuff. Having some problems injecting my library into the player page – but I think I will have that solved shortly. Work is continuing on the Remote Control Library. I successfully tested one approach – with full left-right-up-down movement (and play) on the main Netflix Browse page – however the many HTML5 animations and dynamic loading of content as you scroll left-right is proving difficult to reliably code for. I am now experimenting with various user-agent strings – as Netflix renders their application differently for different types of browsers and versions. So far it appears their IE8 rendering has the least baggage and is fairly easy to manipulate. Good news is I don’t see any major roadblocks yet – so development continues. Work is proceeding well towards the release of the beta. The remote control library is coming along nicely. Basic navigation of the movie grid and the basic player controls – stop, play/pause etc. are working. Still have to code for Netflix page errors and other navigation elements. Still on target for releasing the beta sometime in November. One element that will probably not make the beta will be the switching of profiles – especially the ‘Kids’ profile as it uses a totally different UI. The wait is over! The BETA version is ready for you guys to play with! Be sure to read the Release Notes (included in the ZIP file) BEFORE installing the product. This isn’t finished yet! Still have some UI improvements and CSS to work on; code cleanup; support for profiles and enhancements to the new Remote Control library. Plus – any ideas or feedback you guys come up with. NOTE: After releasing the BETA I noticed a few minor things I wanted to correct; an updated file (Build 20151114) is now posted. It’s been busy ten days! First – a big thank you to all those who have donated to the project and for testing the BETA. As expected, there were some glitches – especially around remote controls; but I think we’re past the worst of it. So what’s next… The three primary goals (see above) have been achieved. Now comes the refinements, tweaks, fixes and – naturally – more functionality. I believe once the Stage 2 goals are achieved we will have our first non-beta quality release. I’m giving myself 60-90 days on this stage’s work – as I have other commitments coming up. There will be more BETA releases in the interim as I improve things and add new functionality. Please continue to send me the all-important FEEDBACK reports. Thank you! I like that this is happening… A lot! While having a mobile app handle some of the tasks is just fine, to me the best approach (if feasible) is that as much as possible can be handled with just the remote control. I recognize there are limitations, but I just don’t want to reach for my phone too often. Thanks! This looks fantastic! I was pretty bummed when I found out the native app was going away but I think this will be be a lot better! Search has always been so cumbersome, I love the idea of being able to use my phone! Already donated, thanks again! Shut up and take my money!! 🙂 I was more than a little upset when I got the message that Netflix was abandoning WMC. After mine stopped working, as they said it would, I waiting about a week and then used some Google-fu to see if anyone had come up with a solution. Imagine my surprise when I found not only a way to restore the old Netflix app, but an app for Amazon Prime video AND a plan to make an even better Netflix app. Your plan is awesome. I, for one, won’t mind paying for it, or donating if you decide to forego charging for the app. The mobile app is an interesting and clever idea. My concern is support for the app on multiple mobile OS. Will there be an app for iPhone, Android and Windows Phone? This seems like a lot of additional development and support on your end. Personally, I would prefer to a built in Search function vice a search app embedded in a Mobile App. Regardless of path ahead, I’m happy to donate to a new MCE Netflix App. The app is a mobile-based web application – so a lot easier to develop than a native IOS/Android/Windows app. So far it is working on iPhones, iPads and Windows Phones. I don’t expect any issues with Android either.It’s working shockingly well. I’ll have to put a video together to demo it soon. Very cool endeavor… and a great concept. Looking forward to more of your great work, Marc! I have virtual machines that can be used to test Win7 and Win8 (and 10 if needed). Let me know. This is pretty slick. I was looking for a replacement so that my mother’s mediacenter could get to netflix again. Otherwise I was going to have to rebuild it as a server and get her a refurbished xbox 360 for the head unit. I’m glad to see you’re using the web interface. That should make mediacenter immune to any more changes to Netflix for the most part as long as the browser remains compatible. Are you making your code open? I’d love to take a peek. Hi Aaron, Still debating if I will open the code or not – though a lot of it will be visible as cs and JS files. Won’t be doing anything to obfuscate it. Awesome! I just donated for your effort alone. I plan to donate more if the app actually comes to fruition. I also do some development, so I would be happy to contribute or do testing if needed. Just curious if you’re planning to tackle profiles? I use profiles (Kids, me, etc) so very likely they will be working in the beta. Glad to see this is progressing. I am using your patch currently for Netflix in WMC, but had a hic-up today (kept saying no interent connection when I did have one) that got me worried. I just donated because of the patch you did, and if this comes out, that will be awesome. As said above, having actual support instead of a workaround will be very reassuring. Wow, this is great. I have only just stumbled across this. One question though and not being too tech savvy, will your app support surround sound? I’m pretty sure the win8 native app is the only one which does at present. It will support whatever the native web experience can support when it comes to audio. Eagerly awaiting the beta release, will gladly pay for this! Working on x86 (thanks! ), but having issues with x64. I’m logged into Netflix with IE, but launching app tells me I’m not logged in. I’ve even tried leaving Netflix IE page open, but same results. Is this a know issue? If not I’ll follow steps to submit issue. Thanks! Has been tested on both; See the release notes for one possible solution; First – in IE under Tools, Internet Options, Advanced – reset IE to default settings. Then, disable Protected Mode under Tools, Internet Options Security. Downloaded and installed Build 20151130 on two computers. Can not get it to work on either WMC. Goes to the red Netflix screen, stays there of a few seconds, flashes to the netflix login screen, then screen changes to gray screen telling me to make sure I have logged in and hit the green button. Yes I have logged into the account before running. Try the following: in IE, Tools, Internet Options, Advanced – and reset IE to default settings; then clear all temporary files and cookies; Disable Protected Mode, then login to Netflix using your id and password (not facebook sso). Then, try the addin – should work. Thank you. It worked for the most part. I had to restart it a couple of times after having to give premissions. Also flashed an error message about 5 seconds going into the netflix menu for the first time. After the third attempt I was able to start a movie. I did notice that when the movie started I lost my mouse. Is that normal? I will check back to see if the beta has been updated. Thanks again..
How do you get the search app for Android? The existing app is just a web-based app that should work on any platform. Would it be possible to add functionality for MCE shortcut keys? I use a program called Intelliremote which detects which program is in use and then customizes the buttons on the MCE remote based on the key events set for each programs profile. Basically, it exclusively intercepts all MCE IR commands (the commands needed to control NetflixMCE!) and then sends out a user defined key event which means I am unable to control NetflixMCE because it does not respond to the MCE keyboard shortcuts, for example, the MCE shortcut key for pause is Ctrl+P. Intelliremote does not have the ability to “pass-through” the original IR commands so I am stuck with keyboard shortcuts. I rely heavily on Intelliremote because of how powerful it makes the customization of a MCE remote so it would make no sense to stop using it so that I can use NetflixMCE, but I’d love to be able to use it. I’ll see about adding some kind of mapping file for the shortcuts. No matter how many times I disabled the IE protection mode, and deleted cookie and website data so I could sign in, after a few hours it would always sign me out again. Fantastic work!!! Much better than any options in Kodi. You asked for feedback on the mobile app, I’d recommend saving your time (I have not tried it). 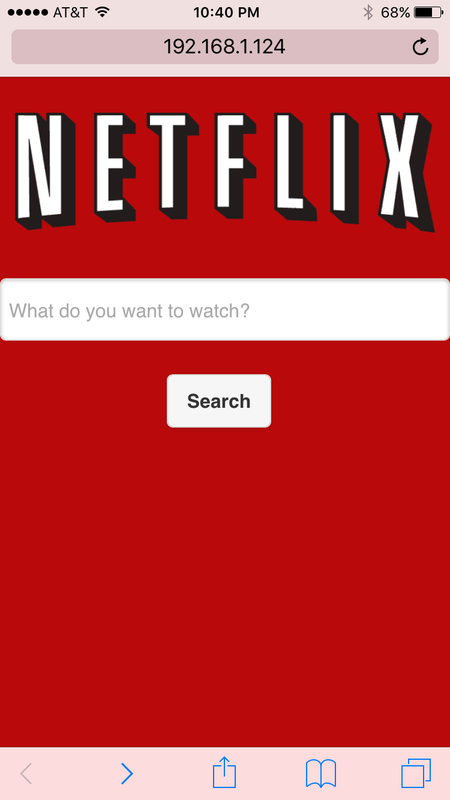 It’s so easy to use the official Netflix mobile app to find what your looking for and then add it to your watch list, it seems unneeded for you to maintain your own mobile app. The only wife complaint with the current implementation is that there is no way when watching a series to see which one you’ve watched until you press play. Along the same lines, when pressing stop on a series show it takes you back to the “my list” (instead of the series episodes list). 1. (Priority: Low) If WMC is not in full screen mode, starting the app makes it full screen, not scaled within the WMC window. 2. (Priority: Low) The mouse cursor is visible in the top region of the app, and if you hover over some of the video tiles, the cursor will disappear after a short delay. Moving the mouse at this point does not return the mouse cursor unless you move it to the very top of the screen again. Since the remote buttons don’t work during playback except play/pause, this makes it difficult to control the content. 3. (Priority: Medium) The screen saver is not prevented while playing content. It will come on whether or not content is playing or paused. Got it working on MCE, Looks great! Before I go ahead and get a remote setup was just checking whether or not buttons were mapped or not using a native WMC remote to control netflixmce…? Any standard MCE remote will work. Thanks, Remote works! I have some feedback on a couple things how should I provide them to you? Just through here or email? Sorry, noob question. When I click on the link to the installer, it takes me to box.com. But it won’t let me download it (tried clicking the white and blue download buttons without luck). I even logged into my box.com account first and still no luck. Anyone else having trouble downloading it? I’m on Win7, and tried both IE11 and Chrome. Thanks for any help. box.com is having problems – I am trying to work with them on the issue. this won’t work on windows 10’s media center, I can provide some more information. it complained about drm, reinstalled silverlight and now the app complains that silverlight isn’t installed when I attempt to play. I verified that i can watch netflix in both Internet Explorer and Edge browsers… Any tips? I understand that, was hoping you maybe had a tip or an idea? I will try to figure it out then. I have not even looked at the Windows 10 WMC hacks so I am not sure where it would be breaking down. As this uses the browser for the most part you need to ensure you have IE 11 present, it should have the latest version of silverlight installed and you should be able to login and play movies from Netflix on IE11. Generally – if that works the addin should work. I also successfully installed Marc’s Netflix plugin and the Microsoft Netflix app restore. I did this months ago so I don’t remember my exact steps. However, I’m pretty sure I didn’t do anything besides updating Silverlight and pre-logging into Netflix using the old Microsoft Internet Explorer (not the Windows 10 default MS Edge browser). Thank you Marc for providing both these awesome utils! Thanks! This plugin is looking better and better. However, I am interested to understand the reason for using mongoose.exe webserver. What purpose does it serve? Can we not launch a browserWindow in fullscreen and control using MCE remote? Something like the MCEWebView plugin? Hi – I am not familiar with that plugin; In this case, the mongoose web server is necessary to support the mobile search app; it is not used to render the Netflix stuff – that is handled by a WinForm app with the webBrowser component – probably similar to MCEWebView. Thanks for a quick response. Thats what I thought it was used for. Will you consider branching this plugin in two versions, one supporting mobile search app and one without mongoose webserver that only supports MCE remote? Does this still work for everyone? Mine no longer works (when I click on a movie, I just hear “click”, “click”, etc for about 30 sec and then the app appears to time out? Just curious if others are seeing the same issue. I have the same problem. I’m going to try logging in again. The repeated click problem started happening to me today, too. I uninstalled and reinstalled and it won’t play anymore, just click, click like it is trying to keep starting the video but it doesn’t play. Fix now available on the blog. Is anyone rise having issues with script errors when navigating in the plugin? Also the mouse arrow had been in the middle of the screen lately. Does this add-in work on extenders? Xbox360 or Linksys DMA2100? Unfortunately no – because I can’t get direct access to the stream. I started getting Java errors inside the app within the past couple of days….It occurs whenever I try to navigate through the page…. Is anyone else seeing this error? Getting the same errors thing here. Also, in a browser, playback is fine, but in WMC, playback will stop randomly. It can be resumed with a space bar click (if a keyboard is handy). I am getting the same java errors whenever I try to navigate with my remote. If I use the keyboard or mouse it works fine. Working on a fix – should be out in a day or so. Build 20160425 working perfect for me! Thanks for sticking with it! Tonight the app seems to no longer be working. Gives either the login needed screen even if already logged in or the script error popup. Note that I have not allowed windows updates in a long time on this machine so It should not be the bad windows update problem. Still seems to be working fine on this end. I’m having the same problem (but I don’t think it has anything to do with Netflix MCE). I think the problem is with Netflix.com and they are now forcing customers to log off at the end of each browser session (let me explain). When I sign into Netflix (via Internet Explorer), I can view my Netflix account and watch movies (again….via IE and ***not*** Netflix MCE). When I close the browser, and then re-launch the browser (and go to Netflix.com), I have to sign in again (I’m no longer automatically signed it). I sign in again and everything works fine in IE, but as soon as I close the browser, I am forced to login again when I relaunch the browser. I also confirmed this with my Desktop Windows 10 computer. I had previously logged into my Netflix account via Edge. When I went to Netflix, I was already (automatically) signed in so I could start browsing Netflix right away. I close the browser and then relaunched it and went back to Netflix. I was still signed in. I then manually clicked “Sign out” on my Netflix account. Once I was signed out, I logged back into my account and then closed the browser. Finally, I re-opened the browser and went to Netflix and I was forced to sign back in again (Netflix didn’t “Remember my device”). Because Netflix MCE needs you to be (automatically/already) logged into your Netflix account via your web-browser, it’s failing (and you’re seeing the “Please sign into your account screen”) because Netflix.com is now forcing it’s customers to log off at the end of each browser session. At least, this is what I think is going on…. coming across this nice plugin for MCE and sadly coming across this same issue. was hoping to get away from using it within a web browser as it html5 crap still uses too much browser memory. This issue appears to be fixed (Netflix site now remembers my information and stays logged into my account even after I close my browser). I did not change any of my I.E. settings. This plugin is awesome! I would like to thank you for putting so much thought into the features and welcoming feedback. Here is another. Allowing the curser to disappear after a few seconds is brilliant, however if I need to use the curser to move to another episode it does not reengage when moving the mouse, this should be allowed. The menu items are bit too large, I am unable to see which episode is selected because of this issue. Anyway – NICE job! I will be contributing to this project! Works great for me! Installed on 2 different Win 7 computers without any issues! What a great product!! Thanks Marc Davis! Putting in my donation today! Hi, I like this plugin very much but I have a problem with it: As I live in Austria, a german speaking country, I want to watch the videos in german. But the videos always start within the plugin in english language with german subtitles. On the netflix homepage under settings, I have german as the default language. I also find no way within the plugin to change the language of the Video per remote control. I like this plugin very much! Sadly, I have a little problem with it: As I live in Austria, a German speaking county, I want to watch the Netflix movies in German. But within the plugin they always start in English language with German subtitles! On the Netflix homepage under settings, I have German as my default language. I also can`t find a way to change the language of a movie within the plugin per remote control. Hi – I will need to look into the language options. 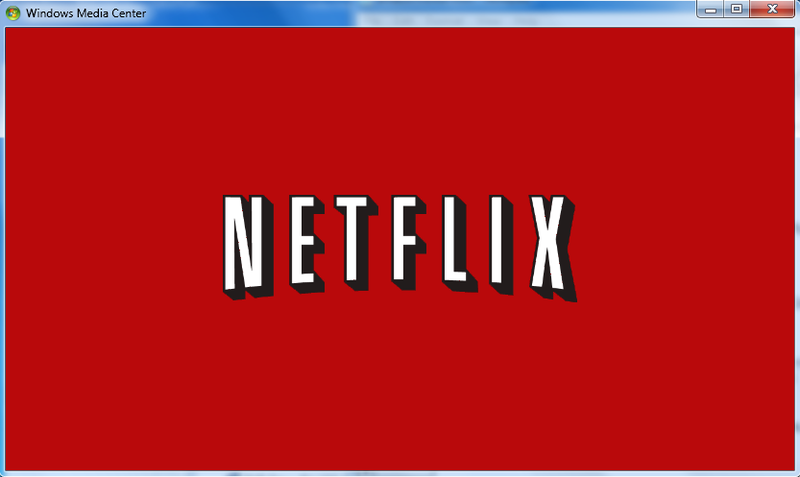 Really got to love this Netflix tool after trying it now for some months, I gave you a donation earlier! Is there any chance you could make it so that once I’d gone say into Documentaries for instance and selected to look at the write up for one particular Documentary and then click the back button it would not go back to the my list of films page but return back to the Documentary list and therefore if I wanted to go back to the main list one more back button click would get me there. As its quiet annoying browsing around and having to constantly go inot my category to search again and again once having gone into one title. Is there a way of altering this? Hi Gareth – I have implemented a proper back-history into the navigation system. The new V1.1 release will be out in a few days. Thanks for your suggestion. Hi Marc, I just checked the discontinued official Netflix MCE plugin and it’s still working. The only issue is, when playing videos all remote control and keyboard shortcut functionality is not available. I’m just wondering why no one is focusing on finding a workaround to fix this? Hi – yes it is still working but Netflix has altered their silverlight player – removing the remote control functionality. I do not see a way of fixing that without a lot of reverse engineering. Please see my replacement addin for Netflix. Please don’t abandon this project. I have not seen any updates lately so it left me wondering what was going on. I have never been able to get the search from my cellphone to work. I would really prefer if you could put it back on the screen using the remote. It is just another device that I have to have while watching Netflix. I WOULD ACTUALLY PAY YOU TO PUT THE FEATURE IN. Haven’t abandoned the project; Improvements to Search and other features are in the works. Hey Bill – got an early Xmas present in the works for ya – remote-friendly on-screen keyboard for Searching and a ton of other improvements will be released in the next day or so. Stay tuned. Having an issue where launching the Netflix App within WMC gives me no control with my Harmony remote. Any button I press to move around on the Netflix causes it to go back to WMC main menu while forcing the Netflix page to the background. Only way to get rid of it is to start task manager and force close it. Any suggestions? Hi Chris – that is very likely a focus issue. If you have multiple monitors or you are running Media Center in window then this can happen. Normally if the app is full screen the NetflixMCE app will send a command to ensure it has focus. If you send kbd or remote commands while the window does not have focus it will return you to media center. Working on an onscreen keyboard compatible with a remote. Still a few weeks out. Hey Marc, Love the app and a I really appreciate all the hard work you have put into it! I will be donating. One question with Remote use.My remote works fine UNTILL I launch a video. after that there is no control what-so ever . No pause play ff rw anything. am I doing something wrong or is this still in the works. Also I love your Amazon Plugin. Works flawlessly. Any chance of a Hulu App? Can you email me the plugin.log file and the make/model of the remote you are using to support@sharepointadept.com? The log file is in the program files folder for the app. thx. Not sure if the entrypoint has changed for netflix. Thank again for your work! Thank you for the fast reply, the below shortcut still does not open netflix, just opens WMC. I’ll need to check your syntax – I don’t use the loader like that. Also – download the 12/12 version – there was a bad css file in 20161209 which makes the new menu unusable. and that works perfects, opens right up into amazonMCE. Tried the same with netflix and no go. Thank you for your help! The categories and hamburger menu don’t work on mine. If I move up with my remote it simply takes me to the search, am I missing something? Make sure you are running the latest version from last night; the previous build had a bad stylesheet. So.. Don’t work for me. I can enter in netflix. See my list, can search.. All ok! but when I go to play some movie/serie, first show the blue dots of silverlight. Then show the screen of Netflix movie/serie, and the red circle came to spin… after about 10 seconds, all stop working. My Netflix is from Brazil. I don’t have the ability to test this in every country but the playback is completely native netflix – I am not modifying anything. So it could be a browser, silverlight or network problem. Working perfect here! Just wanted to say thanks and happy holidays. Just donated this morning, keep up the good work ! Stopped working tonight. Only a gray or black screen appears now: ( used daily in my home please help. I’ve got the same issue (greyed out black screen with scroll bar on the right). I can bring up the search menu, but nothing shows up when I use it (previously, the search bar worked great). New version is available to fix Netflix change today. I’m Still have a black screen on login page. I will check into the blank screen but remember – there is no login from with my app – you need to login to Netflix from Internet Explorer on the media center PC before starting the addin. I re-installed silverlight. Don’t have the mentioned windows updates installed. Just ran a test and everything seems fine here. If DRM is failing it is likely one or more of the following: Incompatibility between your PC and the display; video driver issue; version or settings in Internet Explorer. Be sure you are running IE11; do an Reset in Tools, Advanced to be sure all settings are set to defaults. Also – any DRM protected content may only work on HDMI displays. Love the app way better than the WMC version Im still running. Just wish I could get the Registry entry to control the monitor it defaults to working. My main monitor is 1, but TV is monitor 3 with WMC. When launched the app goes to monitor 1 :(. Tried multiple variations of registry edits as documented in the README. Could not get it to work. Standing by and will keep checking for a fix in future version. thanks for your hard work Marc (use Amazon too). Jim – I just released an update which will fix the multi-monitor issue. Take a look at let me know how it works for you. Thank you so much. My wife has broken off the divorce, and my kids have told me I am their favorite once again. Seriously, I truly appreciate the effort and hard work. The multi-monitor setup works as described. Followed the Read Me – added the reg key NETFLIXMCE, added QWORD(64-bit) Binary Value, set as 0, and good to go. The new interface is far superior to the WMC native app (after html5 update). I HAVE THE PAUSE BUTTON BACK!!!!! Will push a donation in the next few days as a token of appreciation. You’ve enhanced our television viewing pleasure, Marc. Between Amazon and, now, Netflix, your work impacts others – very cool! Hope I can pay it forward one day. Firstly, thanks so much for your effort on this, a donation will be forthcoming from us soon. I’ve run into a bit of an interesting issue – my Media Centre is connected to the network via wireless, and whenever I launch the NetflixMCE recently my ping times to the Media Centre PC go crazy (dropping packets and spiking up to 2,000+ms). As soon as I close it, pings return to normal. If left long enough, it sometimes gets past the ‘Loading…’ screen and is able to be used, but that’s a rarity. I’ve just installed the 20170531 build, but the issue was also happening under the previous build as well. It seemed to happen on around the 9th June when the last round of Windows Updates got installed. I’ve checked to confirm the two you mentioned above are not installed, and they’re declined on my WSUS Server, but I work in IT and the idea of not patching at all concerns me. Are you aware of any current patches causing issues? I’m in the progress of selectively rolling them back at the moment to try and determine which one is causing the issue. There is nothing in the last few builds that should be causing the network glitching you are seeing – though I don’t personally run this over wireless so it would take some effort to try and reproduce what you are seeing. The app is – for lack of a better description – just a shell for the webbrowser control which affords me the ability to inject my own code into the page. It should be behaving like any other web browser would. Regarding the updates – any of the new monthly security rollup updates could potentially contain one or more of those MediaCenter updates that will cause problems with my streaming apps. I can’t code around it – MS changed how URLs are handled in WMC. If you are running Win7+WMC I recommend disabling WIndows Updates to ensure your system doesn’t get altered. Hi. Not sure you still support the Netflix add in but recently I’ve been getting a scripting error on each page and yesterday I’m now getting just a black screen after loading the initial page. Also seeing the same here; Will look into it. Thanks for your hard work!!! I’ve been having some issues with Netflix where media controls stop working and or it will overlay on top of my media center apps. I finally figured out how the problem happens. 1. Launch Netflix and start playing a video. Press the MediaCenter button on the remote. Launch Netflix again. Controls no longer work. 2. My PC is configured to close MediaCenter before sleep and will start MediaCenter on wakeup. 3. Similar to step 2, Netflix instance was still running before MediaCenter was started. When I launch YoutubeTV media center app (Using Relaunch w/ Chrome). Netflix will overlay on top of Youtube and I cannot use my Youtube app. Can you please help to fix this problem?